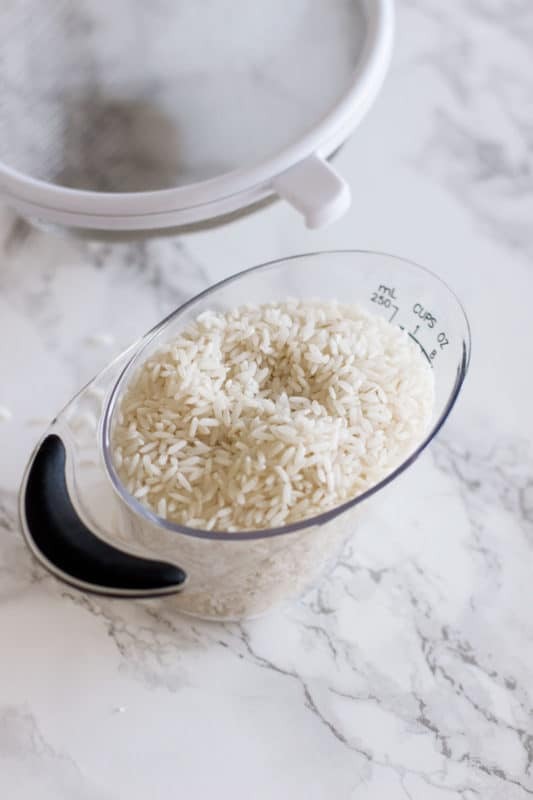 With these step-by-step instructions, you’re guaranteed to make the perfect rice in your Instant Pot EVERYTIME! 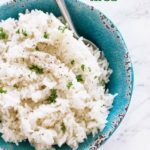 Simple and fast, your Instant Pot rice will turn out moist and flavorful! I eat rice with a lot of different dishes. It just pairs so well with some many foods. But ya’ll, I HATED making rice on the stovetop. It almost always boiled over. And I just don’t love rice from a box. I had heard so many people say that when they made rice in the Instant Pot, it turned out perfect. So I broke down and bought an Instant Pot. And guess what? I’ve fallen in LOVE with my Instant Pot! I’ve made so many different recipes in my Instant Pot and rice is hands down one of the easiest recipes to make. Easy, right? I do try to keep things simple. So, how do you cook rice in an Instant Pot? I’m so glad you asked! I don’t know about you, but there are a lot of Instant Pot recipes out there that don’t really explain the details around using an Instant Pot. Their instructions are so vague and the recipe doesn’t always turn out right. But not this one..NOPE! Get ready because I’m going to break this Instant Pot Rice recipe down step-by-step for you so it’s SUPER clear on how to make the BEST rice in an Instant Pot! First, measure out 1 cup of rice. Use whatever type of rice you want…Basmati, White Rice, Jasmine, Brown Rice, Wild Rice…etc. In my recipe below, I used long grain white rice. Next, pour the rice into a food strainer and rinse with water for about 20 seconds. 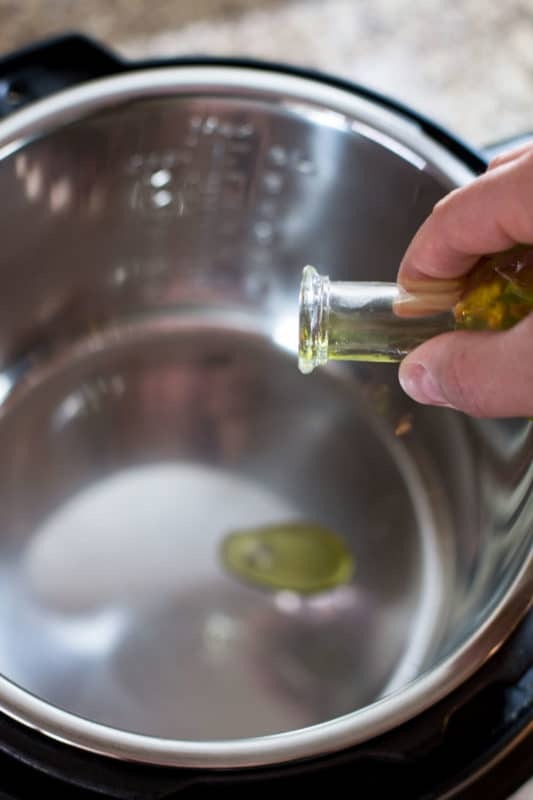 From there, pour 1 teaspoon of olive oil into your Instant Pot. I like to use a basting brush and spread the olive oil around to ensure the bottom is covered. From my experience, this REALLY helps ensure the rice cooks evenly. Then, you’re going to add the rice, water, salt and pepper to the Instant Pot. Now you’re going to put the Instant Pot lid on and turn it until it beeps. That indicated the lid is on and securely in place. You’re then going to move the valve on top of the lid to “Sealing“. Now, it’s time to plug in your Instant Pot. When you plug the Instant Pot in, it will display “Off“. Go ahead and select the Rice setting. Your Instant Pot window should display with a “12” and the pressure should display as “Low Pressure“. After a couple of seconds, your Instant Pot is going to start beeping and the display will switch to “On“. After a couple of minutes in, the Instant Pot is going to start steaming just a little. This is perfectly normal. I was FREAKED out that the lid was going to fly off when I first used my Instant Pot but I promise…this is part of the Instant Pot process. It’s doing it’s “magic”! It’s important to note that the Instant Pot will display on the “On” setting for a short period of time. Soon after, the Instant Pot will start counting down on the display screen. When it gets to L0:00, it’s going to start beeping. Now, go ahead and move the valve on top of the lid to from “Sealing” to “Venting“. This releases the pressure from the Instant Pot, but keep the lid on. 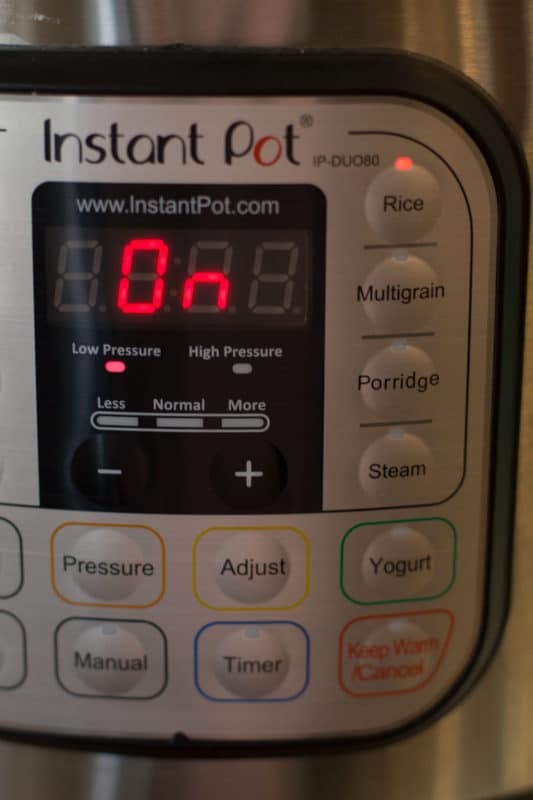 Notice that the display window in your Instant Pot is counting down. When it gets to L008, you’re ready to remove the lid off the Instant Pot. Your rice is done! How easy was that? No pots boiling over on my stove and no mess to clean up! Look how perfect, fluffy and moist this white rice looks! And that’s what you will get from this Instant Pot rice recipe…a nice moist rice. Not “sticky” and not dry. Perfectly cooked rice that turns out right every time! Versions – Did you know there are different Instant Pot versions/generations? I’ve been told that cook times differ based on the version of Instant Pot you own. I have the Instant Pot IP-DUO80 7-in-1 Programmable Electric Pressure Cooker, 8 Qt. 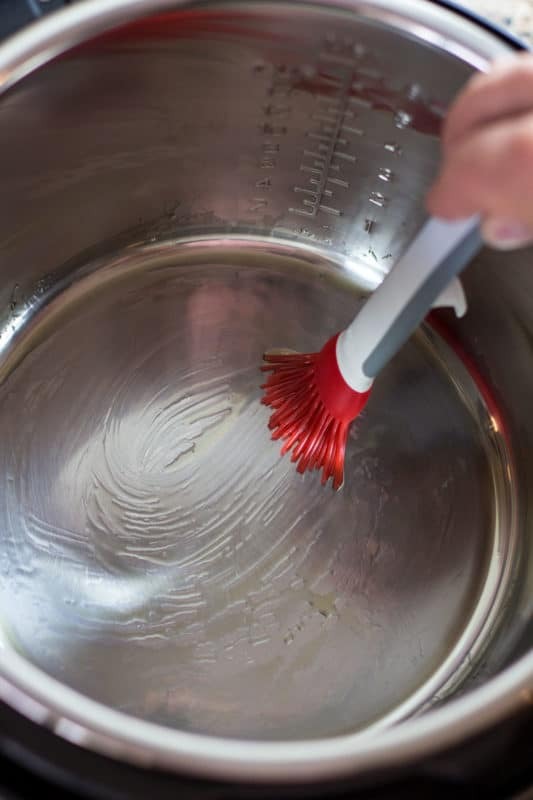 Spreading Olive Oil – In addition to my reference above, I’ve noticed that when I spread the olive oil around with a basting brush at the bottom of my Instant Pot the rice cooks more evenly and turns out perfect! YUM! 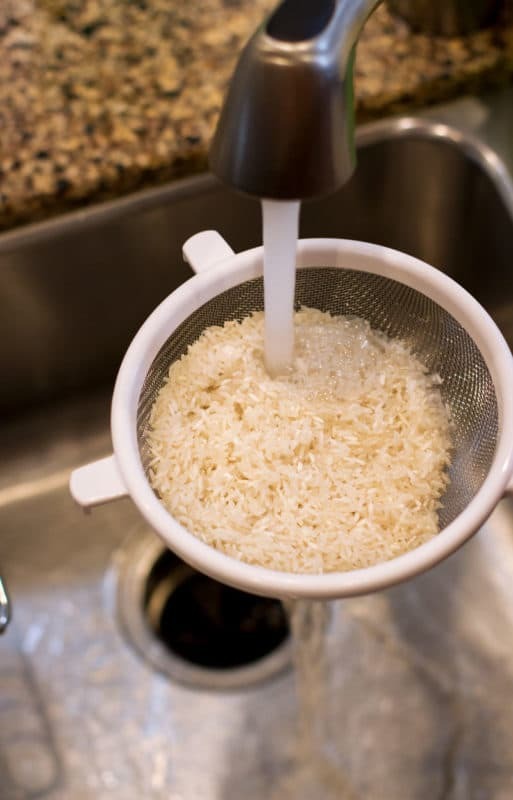 Rinsing Rice – It’s a good practice to get into because it gets rid of some of the starches and it truly does provide more of a clean and fresh taste. Personally, I like to use a mesh food strainer because the holes are so tiny. That guarantees the grains of rice don’t fall through when I’m rinsing. Water to Rice Ratio – There’s a lot of debate about this in other food blogger’s recipes. You’ll often see a 1:1 ratio for rice and water. Well, I don’t like dry rice. I like moist, full and fluffy rice so I use 1 cup of rice to 1.5 cups of water. That’s my preference. How simple was this recipe?! You’re never going to want to pull out that pot to make rice on the stovetop again! Using an Instant Pot to make rice makes my life so much easier! If you’ve tried my recipe for How to Make The Best Instant Pot Rice, leave me a comment! I love to hear from my readers! And don’t forget to rate the recipe below!! Make sure to FOLLOW ME on Facebook, Twitter, Instagram and Pinterest because I’m CONSTANTLY posting recipes that I know you will love! Oh, and share the love by sharing this recipe to your favorite social media channels! For your convenience, I put share buttons at the top of this post! 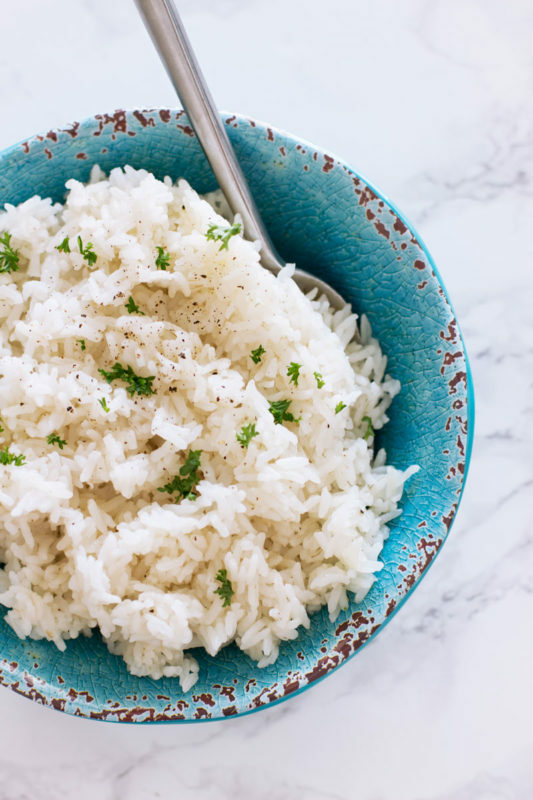 With these step-by-step instructions, you're guaranteed to make the perfect rice in your Instant Pot EVERY TIME! 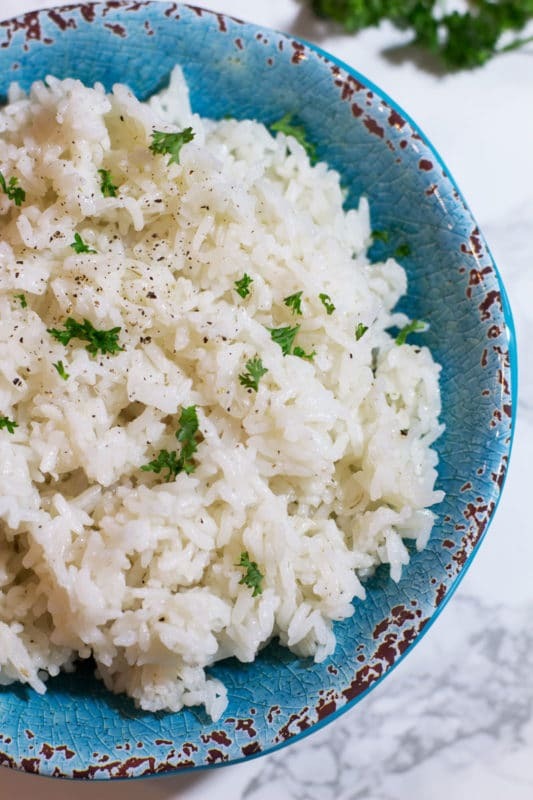 Simple and fast, your Instant Pot rice will turn out moist and flavorful! Measure out 1 cup of Long Grain White Rice. Take a basting brush and spread the olive oil around to ensure the bottom is covered. Add the rice, water, salt and pepper to the Instant Pot. 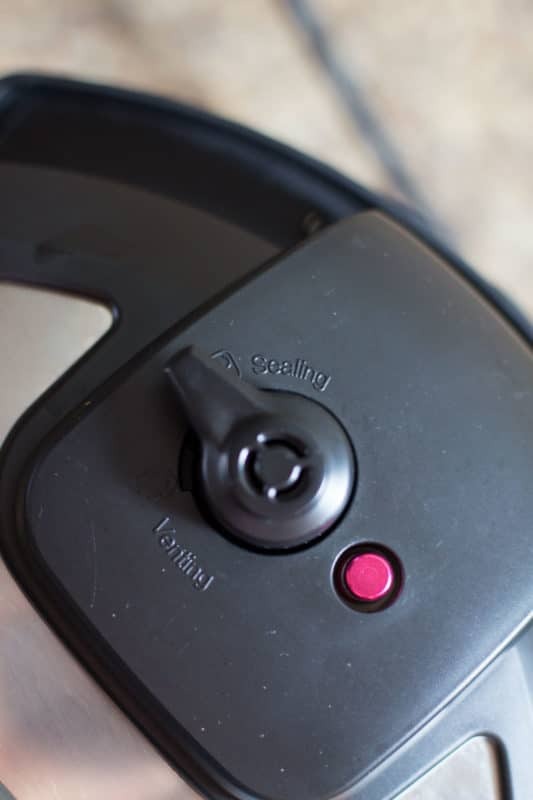 Put the Instant Pot lid on and move your valve to Sealing. Now, it's time to plug in your Instant Pot. When you plug the Instant Pot in, it will display "Off". Go ahead and select the Rice setting. 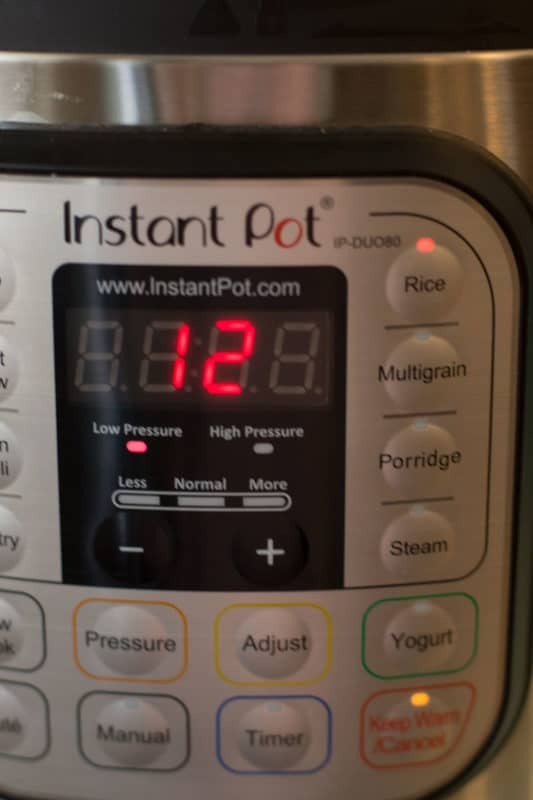 Your Instant Pot window should display with a "12" and the pressure should display as "Low Pressure". After a couple of seconds, your Instant Pot is going to start beeping and the display will switch to "On". After a couple of minutes in, the Instant Pot is going to start steaming just a little. This is perfectly normal. 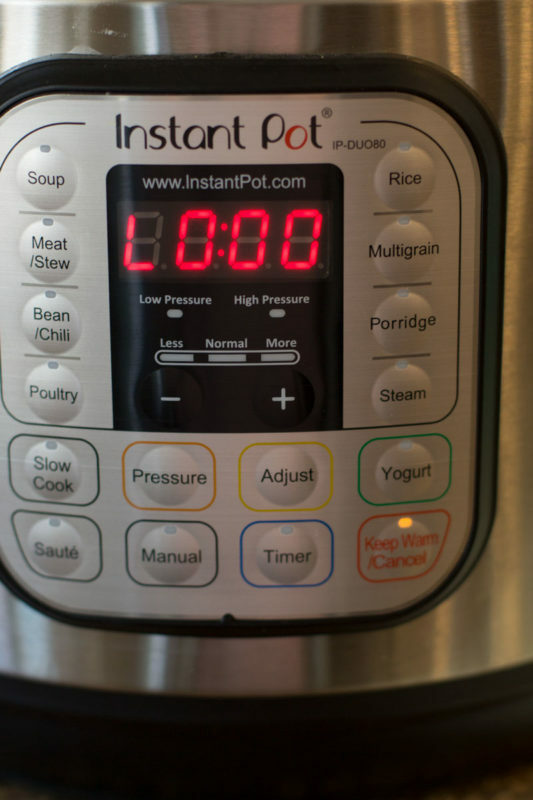 The Instant Pot will start counting down on the display screen. When it gets to L0:00, it's going to start beeping. Now, go ahead and move the valve on top of the lid to from "Sealing" to "Venting". This releases the pressure from the Instant Pot, but keep the lid on. 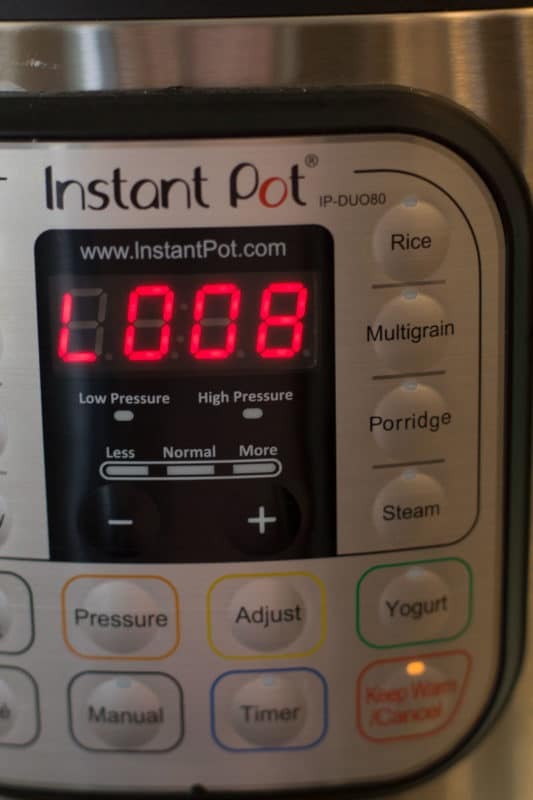 Notice that the display window in your Instant Pot is counting down. When it gets to L008, you're ready to remove the lid off the Instant Pot. Serve immediately. Place any leftovers in the refrigerator. I haven’t dreamt of cooking rice in my Instant pot but you make it seems so easy so I’m going to do it now. It’s a true gift…saves you a ton of time and your rice will taste better! I have a party this weekend and am making gumbo. Any tips on how to make rice for 30? I’ve not made rice in my instant pot for that many people BUT I’ve read that you can triple/quadruple the rice and water and not adjust the time. 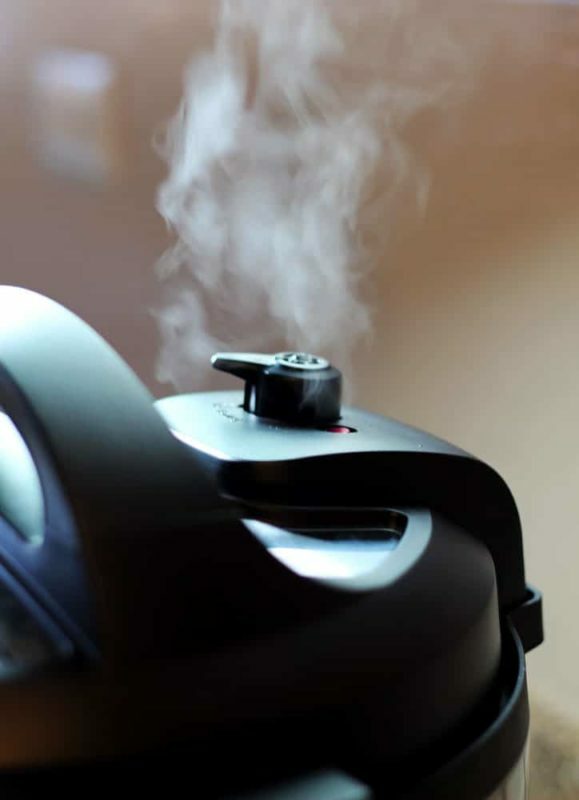 The pressure in the Instant Pot essentially cooks it the same amount of time regardless of the servings. I’ve not confirmed this yet…but good luck on your party! I followed your recipe to a tee! I have a 6qt duo plus. I hit the rice button it was on low for 12 minutes, got to 0 (display didn’t say L000 like you said) just 0000. Released steam, left valve open and then it started counting up again no L just 0001 and so on. When it got to 0008 I anxiously opened the lid and it was kinda stuck to the bottom (I used oil with brush) and kinda sticky. I was so looking forward to fluffy rice! Keep in mind I haven’t had my instant pot long at all and this is my 4th time using it so maybe it was my error. Help!! 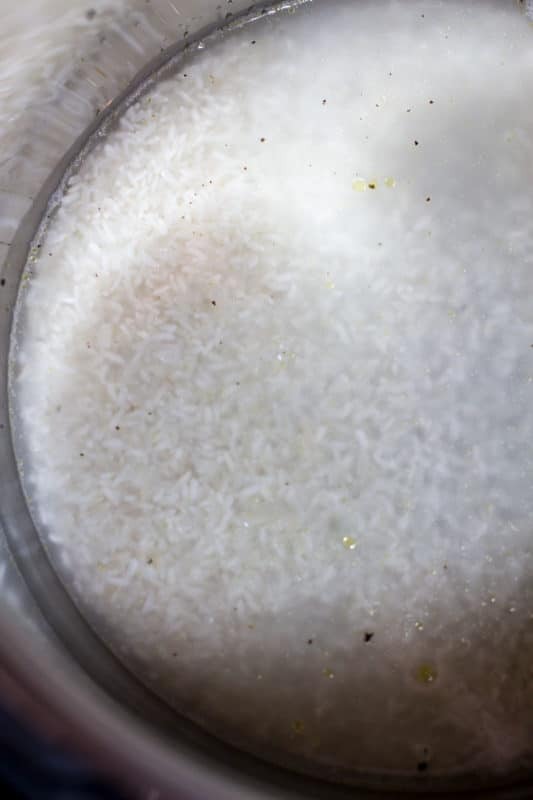 Hi Jenna – I love a little moisture in my rice so the ratio of water to rice is perfect for me. 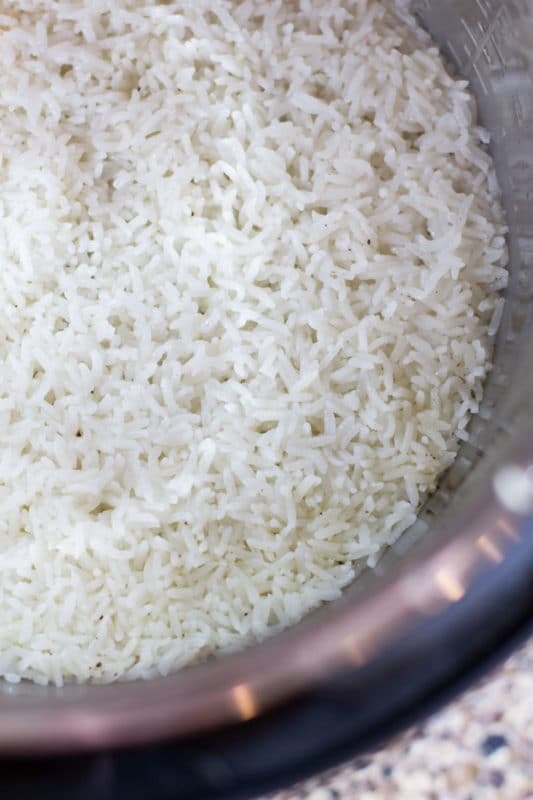 You could try 1 cup of water to 1 cup of rice to see if that makes it more fluffy for you. Did you put olive oil on the bottom? If so, maybe use a little less. Make sure the olive oil is evenly spread on the bottom. Make sure you rinse your rice. You could try making this on manual mode instead of the rice mode. Look at my recipe here for mexican rice and follow the manual settings: https://recipesworthrepeating.com/instant-pot-mexican-rice/. Let me know how the 2nd batch turns out!! I had the same problem as Jenna above. I tried this last night and my rice was super sticky and glumped together — almost like mush. I have a rice cooker that cooks it perfectly every time. Was hoping to get rid of it and just use my instapot because my rice cooker takes 45 min. Any additional suggestions? Is altitude an issue? Hi Julye! I have no idea why your rice would have turned out like this. So many people said they have followed this recipe to a “T” and it turned out perfect. The only thing I could think of is the elevation. As you in a high elevation? Do this…try a 1:1 ratio and see how it turns out. So 1 cup of rice and 1 cup of water. I make this rice at least once a week and it’s perfect every time! I tried this recipe in my 6 qt. today as my first attempt. I followed your recipe to the “T” and my rice came out perfect! Thank you! Awesome!! So glad to hear!! Thank you so much for writing to let me know!! Enjoy! Hi there! So if I want to make Jasmine rice in the Instant Pot Ibwould choose “manual or pressure cook” button instead of “rice”? Since I only want it to cook for 8 mins according to your post? I’m new to this so just checking! If I choose “rice” it will automatically cook for 12 minutes which will be too long right? Thank you for any help you can offer!! 1. Cook on high pressure for 3 minutes on the rice mode. You can adjust the time down from my original instructions in the post. 2. Once it stops beeping, natural pressure release for about 8 minutes. For Jasmine rice, I would not rinse it before hand.